FOLLOWING THE INCESSANT humiliation and slavery of African migrants including Nigerians, other African nationals in the hands of Libyan human traffickers in Tripoli which leads to sale of Africans in Tripoli under the cover of darkness and various sexual attack forced on African girls under their detention, Nigerian civil rights group have risen in unity to denounce the notoriety of the Libyan traffickers as ‘wickedness’. To contain this evil trend on-going in Libya, the Nigerian civil rights group in a press statement titled: ‘We Shall Occupy Libya Embassy’ slated for today, Thursday Nov 30, 2017 at exactly 10:00am held a peaceful sit-outs protest around the Libya Embassy located at Roseline Ukeje Close, Kyari Muhammed crescent, off Justice Sowemimo street, Asokoro, Abuja where there was a traffic gridlock as a result of the demonstration. Prior to the sit-outs peaceful protests 24 hours earlier, the leaders of these Nigerian Civil Rights coalition under the banner of Charles Oputa representing ‘OurMumuDonDo’, Deji Adeyanju for ‘Concerned Nigerians’, Ariyo Dare Atoye for ‘Coalition in Defence Of Nigerian Democracy’, Moses Paul representing ‘MAD Connect’ and Bako Abdul Usman for ‘Campaign For Democracy’ in a joint statement said: “We are horrified by the reports and footage of hundreds of Africans, including Nigerians, being sold into slavery by slave dealers in Libya as published by Cables News Network ‘CNN’ and several other international media houses. kept, beaten, starved and killed. It is shocking to find that slave trade, a horrible part of African history which is best confined to our collective past and best studied to avoid a repeat, is being conducted so brazenly in these modern times. Meanwhile, Libya Embassy officials fearing Nigerian protest may turn violence and they may be harmed in the process quickly contacted Nigeria’s Inspector General of Police (IGP) office to for police protection, which was approved. 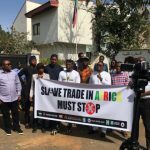 As such, gun-wielding Nigerian policemen were already in front of Libya Embassy gate forcing these Nigerian Right Group to a stop. Attempts made to Libya Embassy officials as at press time to get their reaction prove abortive….